Home » Travel Products » Le Pliage Longchamp Backpack Review: Why is this Bag so Popular for Travel? Longchamp is known for its elegant bags, but who knew they also created a durable, versatile, and packable backpack that’s perfect for traveling? 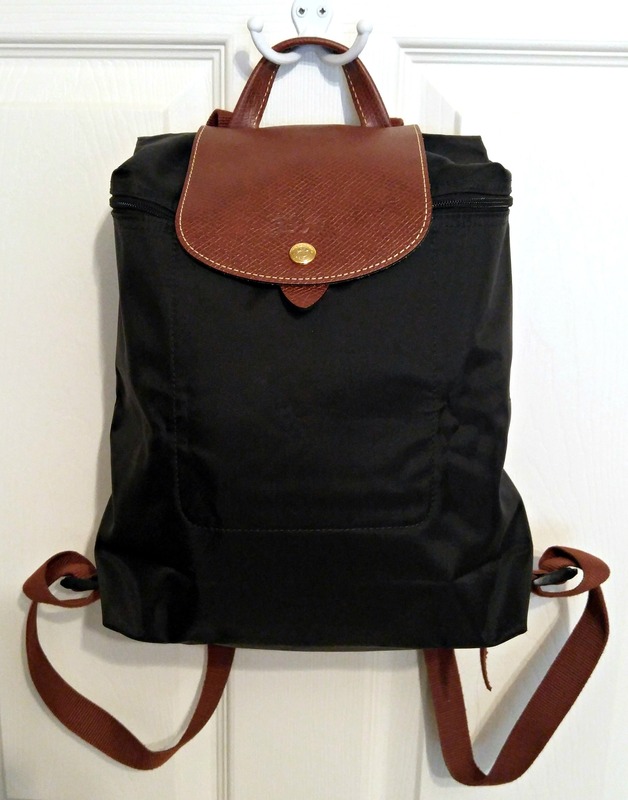 Read our Longchamp Backpack review and find out why female travelers love this bag! There are various settings where I like to bring along my folding, packable Longchamp Le Pliage Backpack. 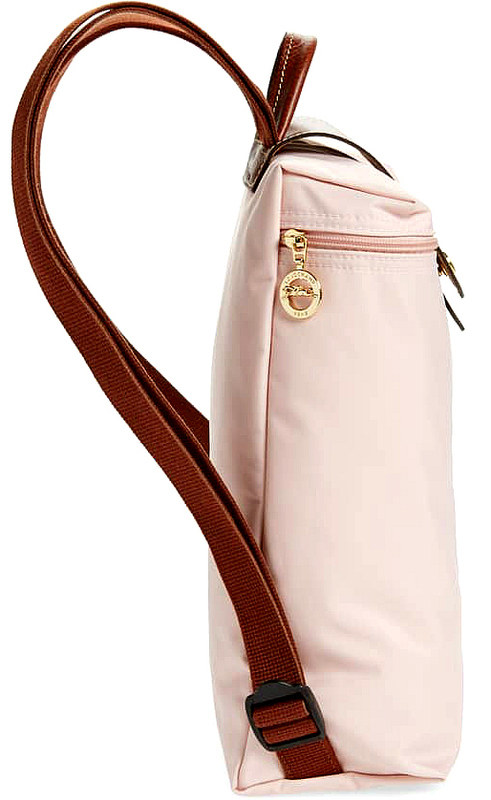 If you love the versatility and practicality of the Longchamp Le Pliage tote bag, you’ll love this backpack. It’s excellent for those just-in-case situations when you need to be hands-free but still look stylish! An awesome addition to your travel capsule wardrobe. Material: Similar to the Longchamp Le Pliage tote bag, the backpack is made of Polyamide canvas with a water-resistant coating on the inside. The trim is leather cowhide, and the adjustable straps are made of a webbed fabric with plastic attachments. Color: The backpack comes in more than half a dozen colors, all with a brown leather handle and flap with metallic gold details, and brown webbed fabric straps. Opening Type: The backpack opens at the top with a zipper. The zipper is covered with a decorative leather flap with a metallic gold snap and beige stitching. Features: Inside the backpack, there is one small pocket (5.5″W x 6.5″H) at the very top near the zippered opening. The pocket fits a cell phone, business cards, or perhaps a bus pass and lip gloss. Security: There are no enhanced security features with this bag. It does close with a zipper and a snap on the covered flap. Travel Type: Perfect for carry-on, luxury, vacation, business, and city break traveling. The elegant Longchamp Le Pliage Tote may be the inspiration for this bag. The oh-so-popular tote among female travelers still requires you to carry it by its handles. The Le Pliage backpack lets you go hands free, which is always a bonus! 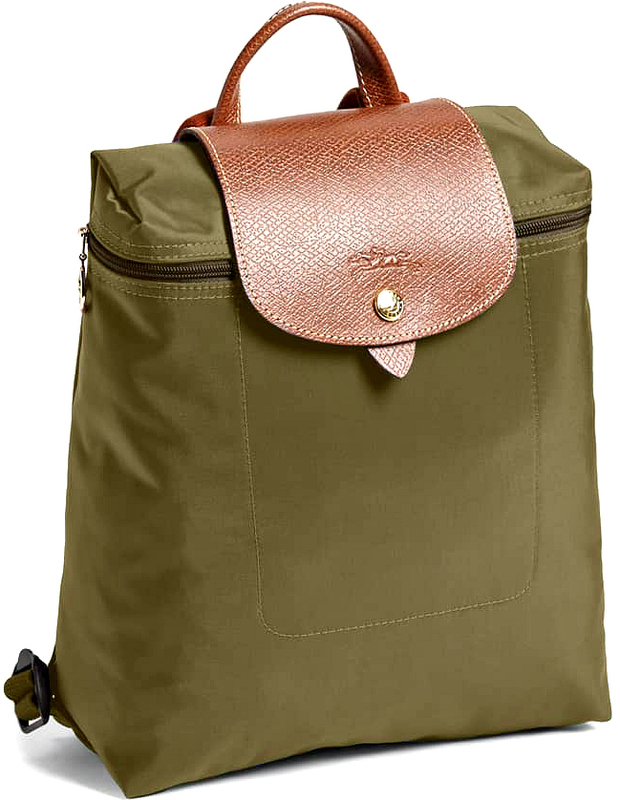 The principal reasons you want this Longchamp Le Pliage Backpack are that it’s collapsible, easy to clean, water-resistant, and lightweight. It takes up very little space in your closet when storing, and it packs small inside your suitcase when traveling. 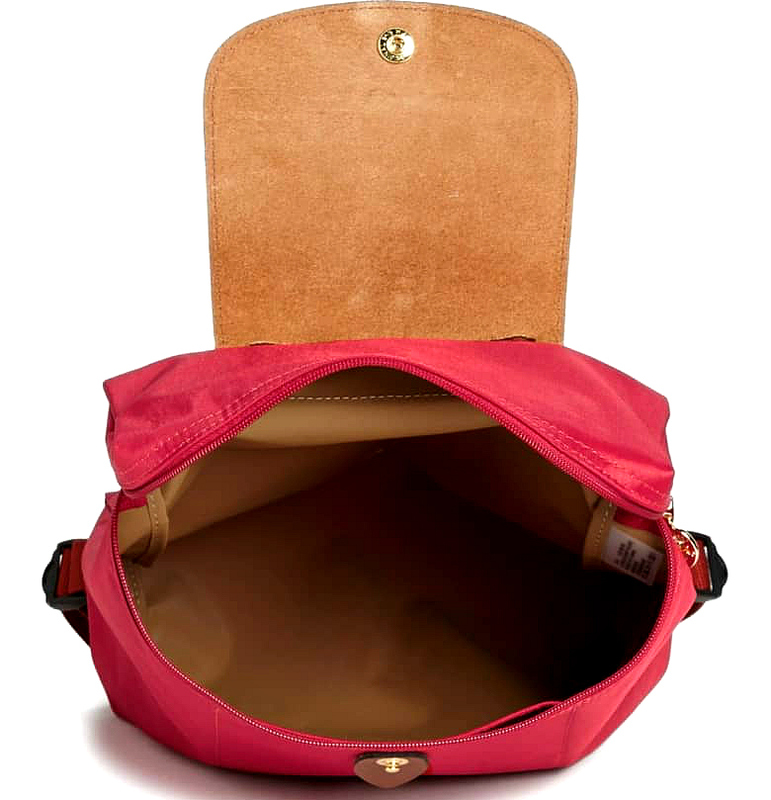 Read why Longchamp bags are the best for travel! I’ve had my Longchamp Le Pliage Backpack for a couple of years now, and it hasn’t shown any signs of wear, but I don’t use it daily. I feel that since the main body of the backpack is Polyamide canvas that it should last quite a while, especially since the internal seams of the fabric are reinforced and covered with seam binding. However, I feel the main stress points over time would be the corners and where the bag folds after long-term use. The nylon-type fabric is easy to clean, wiping off easily. Read why we love a convertible backpack purse for travel! Longchamp bags are known for their understated chic look, and the Le Pliage backpack is no exception. Made with the same careful detail as its other handbags, the Longchamp mini backpack is impeccably styled. 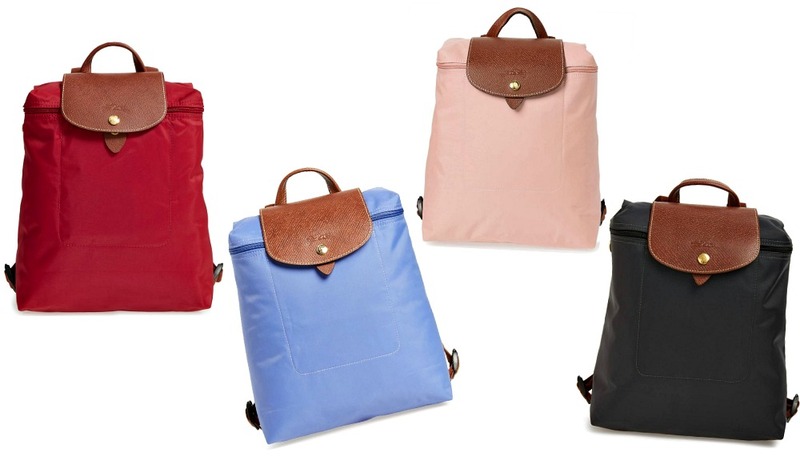 I typically use the Longchamp Le Pliage Backpack when I want to be hands-free but also a bit dressy. It’s great for an urban setting, when you want to look nicer. It’s a designer backpack style that’s in high demand, and as a result, you’ll see a lot of knock-off versions and imitations everywhere you look. Because of its popularity, it isn’t as much of a designer exclusive brand as it once was. Be careful when shopping and ensure you are buying the authentic product if you’re looking for Longchamp bags. Learn to Pack Light Stylishly with my e-book! Since there are no organizational features inside, everything falls to the bottom of the bag. I suggest you use makeup bags or small packing cubes to organize your contents. There are no organizational features inside the Longchamp Le Pliage Backpack other than the one single pocket for your cell phone. I wish that there were at least a metal ring or a tab inside so that I could attach my keys for easy access so that I didn’t have to rummage around the bottom of my bag to find them all the time. You can, however, fit a lot into the space, which makes it nice when you’re traveling and want to keep necessities with you. Pack in a travel umbrella, wallet, cell phone, sweater, lip balm, guide book, even a bottle of water. It’s not advertised as a Longchamp laptop bag, but it certainly would hold a tablet or a smaller laptop. The zippered top would help keep electronics safe in transit. Watch this video to learn how to use packing cubes to organize your bags! 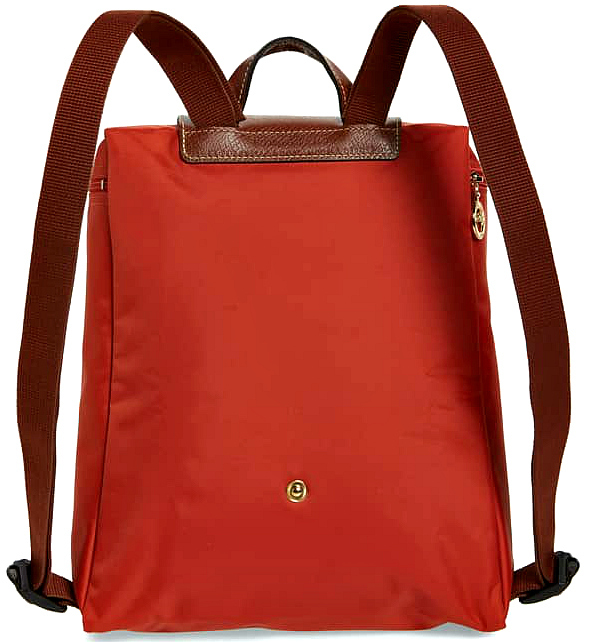 The Le Pliage Backpack is very lightweight — weighing less than a pound. But, of course, the more you put in it, the heavier it will get. Plus, the webbed straps will pull on your shoulders since there is no added padding. I do find that the straps chafe a bit under your arms if you are wearing a sleeveless top. You wouldn’t want to use the Longchamp Le Pliage as a regular backpack, but for a dressy choice when you want to be hands-free, it works great. For the minimalist traveler, it packs flat into your carry-on and takes up little space! Read how to choose the best travel backpack! 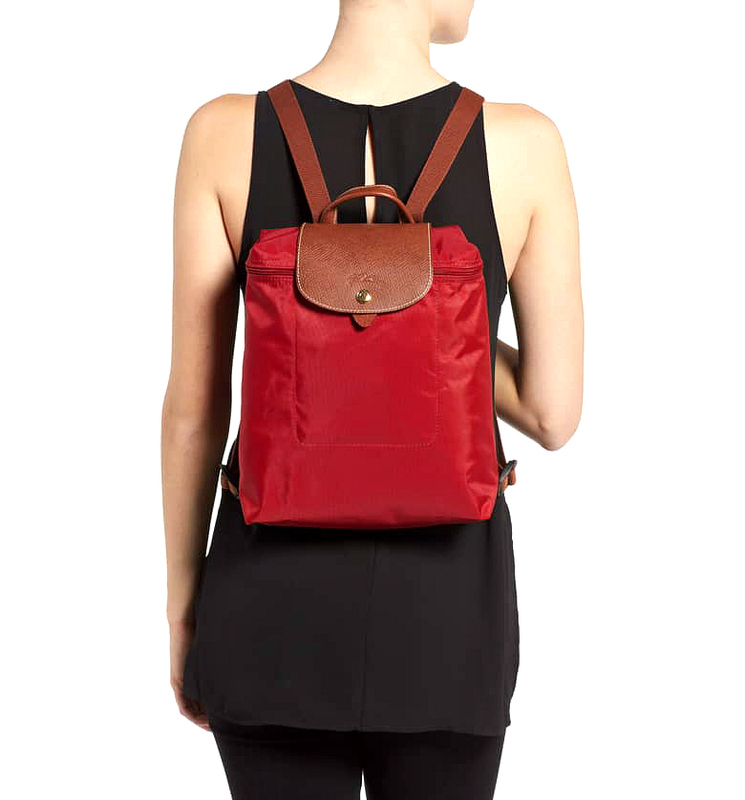 I think the Longchamp Backpack is an excellent bag for an urban traveller. It also makes a great companion piece if you already own the Longchamp Le Pliage Tote. Having both gives you a choice when you travel to go hands-free. It’s something to throw into your suitcase for those opportunities where you want to be stylish and not worry about holding onto your purse — like when you need to wrap your arms around the waist of that cute Italian boy who just invited you for a ride on his Vespa. Find out why so many female travelers also love theLongchamp Le Pliage Tote! After reading this Longchamp Le Pliage Backpack review, you can shop for this versatile and stylish backpack at Nordstrom. You’ll find eight color choices, all with the classic brown leather and gold hardware. Do you own this bag? 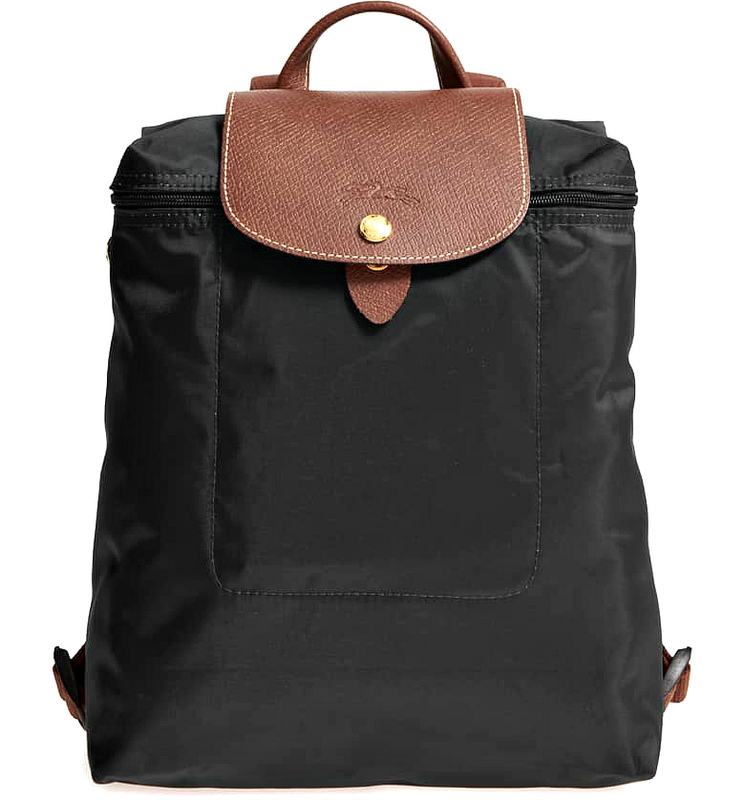 Share your Longchamp backpack review in the comments below! 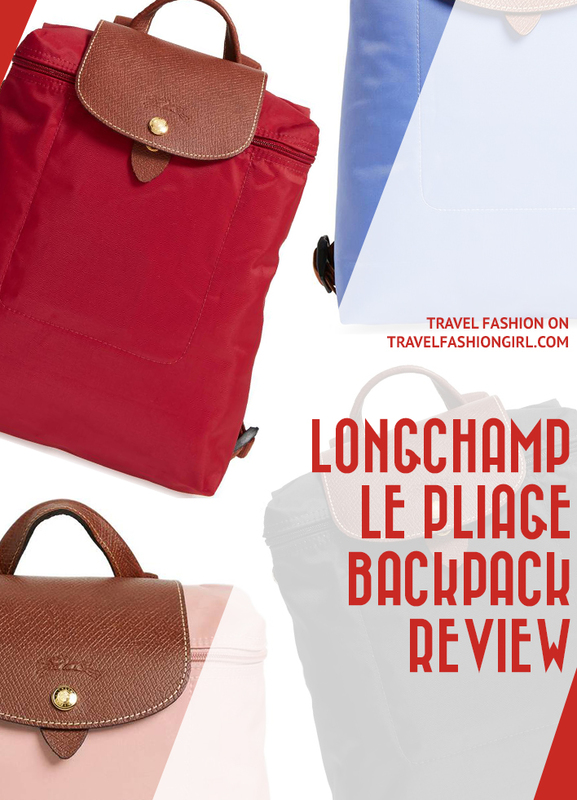 I hope you enjoyed this Le Pliage Longchamp backpack review . Please share it with your friends on Facebook, Twitter, and Pinterest. Thanks for reading! 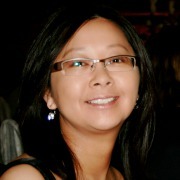 Author Bio: Mary Chong is a Canadian travel writer, food reviewer, and carry-on only traveler. Mary shares travel advice, helpful tips, honest reviews, and travel inspiration for destinations throughout the world on her website Calculated Traveller Magazine. I received my backpack for Christmas and love it, however, the straps are way too long and I’m not sure what to do with them. Nowhere to tuck them in? Love this backpack and took along on my River Cruise this summer and will take it again on my next one in a few months! I love how it’s light, foldable and stylish! I have a black one of these and love it! I live in Madrid and have used it as my daily bag for more than a year, with only slight signs of wear (at the corners, like you said). One plus is that I found Longchamp products cheaper here in Spain than in the U.S. I bought mine here in Madrid and very happily claimed my VAT refund on my next trip, too! thank you for the tip Danielle! When travelling carry on only weight is so important and would be helpful if you would include that for the items you recommend. I love the look of theRebecca Minkoff bag but packing it to bring along as a day bag it looks quite heavy. Great feedback Gill! You can find the weight of the product featured in this post in the “Basics” section of the article. Thanks!